"Every war has a beginning." Rise of the Lycans, also called Underworld 3, is a prequel to the previous two Underworld movies, and it details events in the distant past, which make up the history of most of the cardinal players in the chronologically later films. The film shows the origin of the character Lucian (Michael Sheen), who is the first Lycan, a werewolf that can take human form. Raised by vampire lord Viktor (Bill Nighy), Lucian is to be the first of a slave race that can be used for labor, strong-arm work, and to defend the vampires while they sleep during the day. Lucian begins to develop a friendship with Viktor's daughter Sonja (Rhona Mitra), though they keep this relationship hidden. During an attack from savage werewolves, Sonja is put in danger. Rather than rescuing her, the Death Dealers (elite vampire warriors) choose to stand by and await orders. Lucian runs in and saves her, changing and cowing the other werewolves. Despite his rescuing Sonja, Viktor has Lucian whipped and imprisoned for acting on his own initiative, describing it as betrayal. Lucian escapes with Sonja's help and begins roaming the countryside recruiting rebels from the werewolf and human populations to rise against the vampires. Sonja is imprisoned, and Lucian goes to rescue her. He manages to save her, only for both of them to be captured by the Death Dealers and put on trial. Sonja is sentenced to death after revealing that she's pregnant, and Lucian is forced to watch the execution. Afterwards he transforms and escapes, overpowering Viktor and making it to the fortress wall. Letting loose a howl, Lucian summons his rag-tag army into a clash with the vampire legions. By the end of the fight, Viktor appears to be dead (though he isn't), and Lucian declares a victory in the first of the great conflicts between the two races that won't end until one or the other of them is dead. 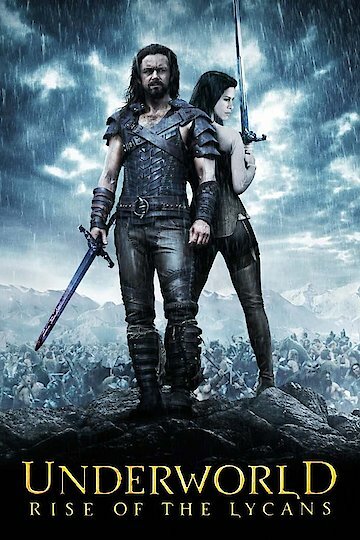 Underworld: Rise of the Lycans is currently available to watch and stream, buy on demand at Amazon, Vudu, Google Play, FandangoNow, iTunes, YouTube VOD online.